Welcome to the Midwest Gypsy Horse Association. but mainly through an annual show located in the Midwest. Refresh your browser to get the latest updates. Refresh your browser for the latest updates. We have lined up GVHS & GHRA carded judge Adam Longman for the 5th annual Midwest Gypsy Horse Show 2019. Adam is an avid horse professional located in Western Minnesota. Our third show was success!! We have beautiful canvas tote bags that are made of 100% Natural 12 oz cotton. The size is 19" x 15" x 6" and they are fabulous. I have them for my own personal use for shopping and I love them. They are sturdy and hold a lot. The fabulous artwork was designed and donated by Samantha Beausoleil, thank you so much Sam. 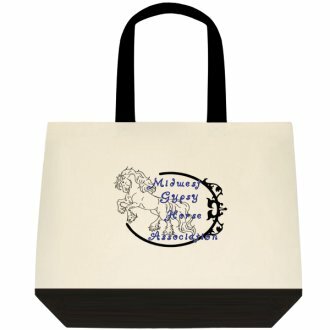 These bags are $25.00 each U.S. funds plus $6.00 shipping. If you would like more than one I will get you an updated shipping cost, just message me.